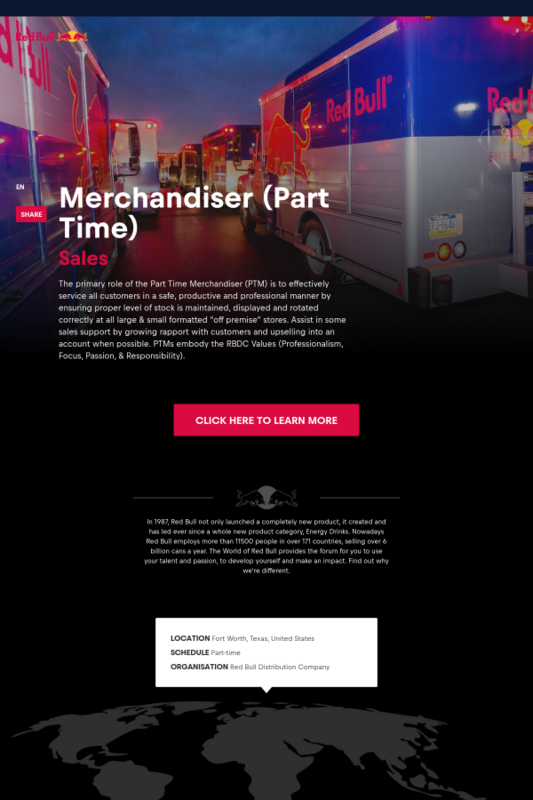 The primary role of the Part Time Merchandiser (PTM) is to effectively service all customers in a safe, productive and professional manner by ensuring proper level of stock is maintained, displayed and rotated correctly at all large & small formatted “off premise” stores. Assist in some sales support by growing rapport with customers and upselling into an account when possible. PTMs embody the RBDC Values (Professionalism, Focus, Passion, & Responsibility). Notify appropriate Account Sales Manager for pick up and / or exchange of any dented, damaged, or out of code product, as well as any out of stock items, and Quality Point of Distribution (QPOD) opportunities. Establish and maintain friendly and professional relationships with retail managers of accounts. Employee is regularly required to use hands to finger, handle, or feel; reach with hands and arms; and talk or hear. Employee frequently is required to walk and sit. Employee is occasionally required to stand and stoop, kneel, crouch, or crawl. Employee must regularly lift and/or move up to 25 pounds as needed. Confirmed 2 hours ago. Posted 28 days ago.